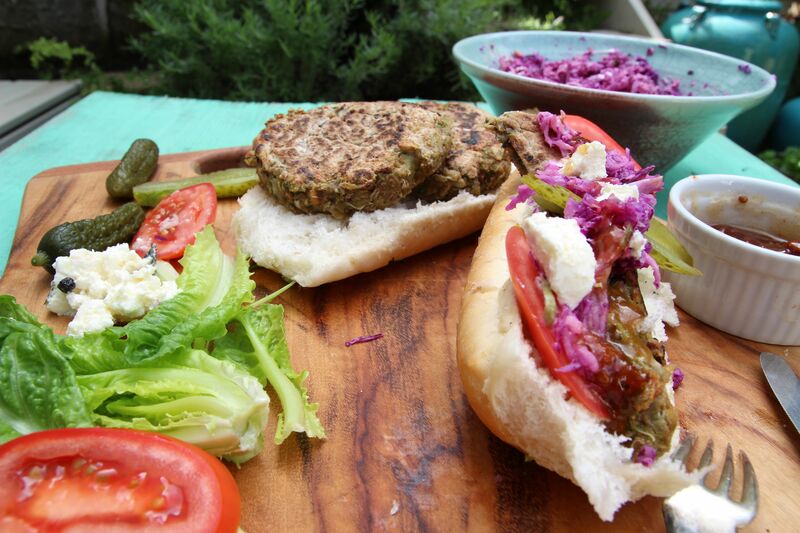 These are veggie burgers – and if you minus the feta, they are vegan too! 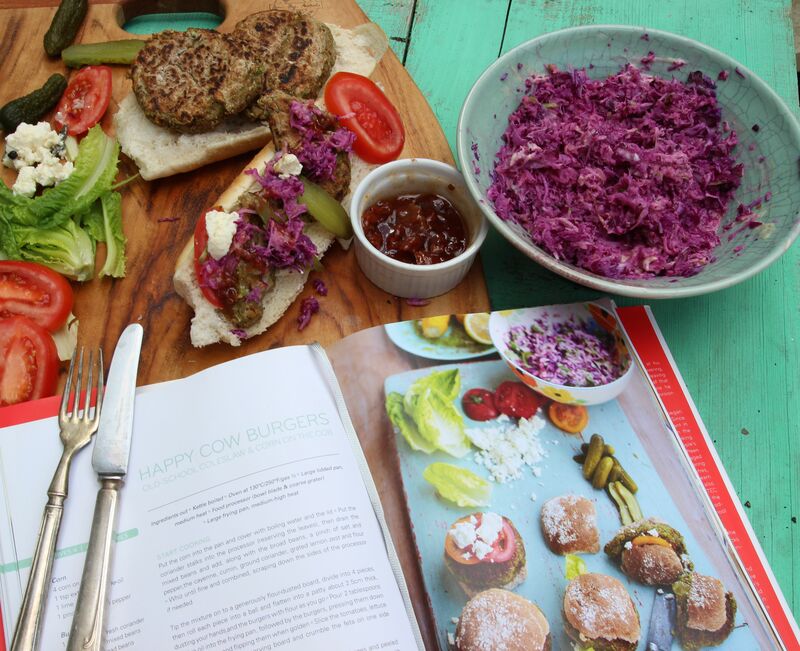 Aptly named “Happy Cow Burgers” as there is no “cow” in the recipe. The recipe is from Jamie Oliver’s 15 Minute Meals, and I have listed the recipe pretty much as Jamie wrote it with a couple of my own tweaks. Put the coriander stalks into the processor (reserving the leaves), then drain the mixed beans and add, along with the broad beans, a pinch of salt and pepper, the cayenne, cumin, ground coriander, grated lemon zest and flour. Whiz until fine and combined, scraping down the sides of the processor if needed. Tip the mixture on to a generously flour-dusted board, divide into 4 pieces, then roll each ball into a ball and flatten into a patty about 2.5cm thick, dusting your hands and the burgers with flour as you go. Pour 2 tablespoons of olive oil into the frying pan, followed by the burgers, pressing them down with a spatula and flipping them when golden. Slice the tomatoes and gherkins and place on a serving board with lettuce and crumbled feta. Heat the rolls in the oven, if you want them warm. If the buns are a really soft and fresh, serve as is. Swap to the grater in the processor, then grate the cabbage and peeled red onion, and tip into a bowl. Chop the coriander leaves and add, with the yoghurt, mustard, and the juice of the zested lemon and brown sugar, then toss well and season to taste. Remove the rolls from of the oven if heating them, and cut them in half. 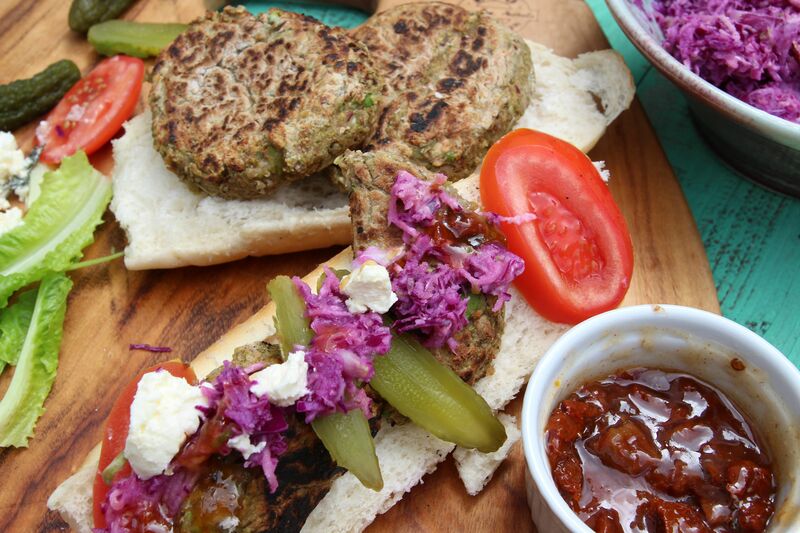 Serve burger patties with tomato chutney, coleslaw, feta, tomatoes and gherkins. Posted in Jamie Oliver, Salads, Savoury Food, Vegetarian and tagged 15 Minute Meals, bread rolls, cabbage, coleslaw, feta, gherkins, Jamie Oliver, red onion, tomato chutney, vegan, vegetarian, yoghurt. Bookmark the permalink.